Medieval towers pierce mauve infused sunrise fog. Visions of another time are easy here, so close to Milan yet centuries away. This city of a thousand, so named for the citizens role in Italy’s unification, is a unique surprise about an hour by train northeast of Milano. Though the city has become increasingly industrial in focus, the upper town (La Citta Alta) offers visitors unique insights into Italy’s political and architectural history. With commanding views over the Val Brembana and Val Seriana, coupled with its position on alpine foothills between Milan and Venice, made Bergamo ripe for conquest. Beginning with the 6th Century, and continuing through the mid-1800’s, the city has experienced the political control of governments from Bohemia to France. Above the fray, the upper city’s residents retains a spirit of independence and fierce pride. The highest point in the upper city is Castello di San Vigilio, a fortress with a tiny group of buildings. 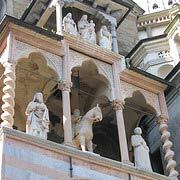 The small chapel of Santa Maria Madallena was used by defenders of the city as early as the 11th Century. The views from this highest point in the city are unforgettable. It is very easy to understand why this fromidable structure has been so coveted over the centuries. 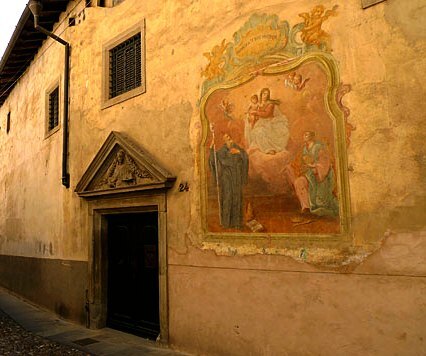 After visiting the Castle, you can easily walk down to the Piazza Duomo, the main square of the Upper City, stopping for visits to the Museums of Archaeology, Donizetti – Bergamo’s most famous composer and Science. All of these are well worth the visit. If you time is limited, I recommend, at a minimum, the Archaeology museum. The Accademia, the Carrara Museum, is absolutely worth a few hours time as well. For those whose interests te nd to the influence of religion on the life of Italian cities, the Basilica of Santa Maria Maggiore is a must. Construction on the church started in the mid 12th Century, with additional works continuing through the latter part of the 16th Century. Classically styled in a Roman, nearly Byzantine style which is referred to locally as Roman-Lombard style, the facade is spectacular. The narrow lanes and byways of this part of the city invite time to linger, to allow all five senses to absorb the city’s profound history. 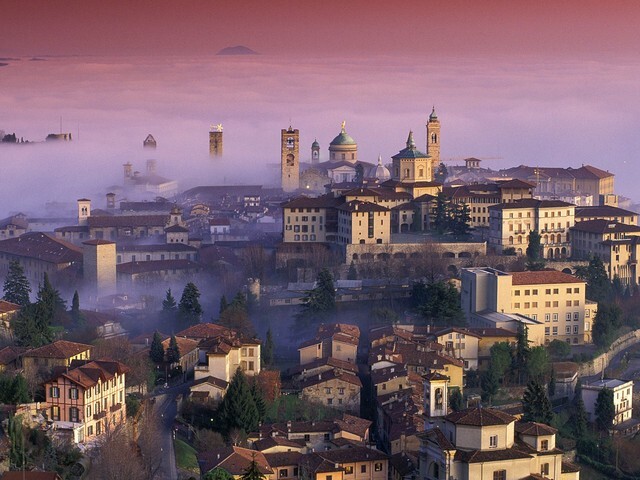 I have a preference to visit Bergamo during the winter, when fog often wraps the streets and the absence of other visitors lends a more romantic and historic feel to time in the upper city. Bergamo is reached by train in about an hour from Milan’s Centrale Station. Upon arrival, I recommend buying a bus ticket at the information booth just outside the station. The A1 Bus will bring you up to the level of the second Funicular railway, which takes you all the way up to the Castello di San Vigilio. From there, you can easily walk down into the city. Return buses to the train station depart from all of the bus stops in the upper city. 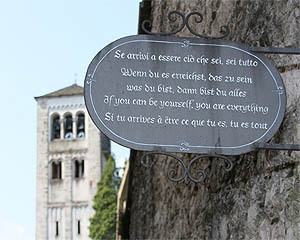 Timetables for the bus and funicular systems are found here: ATB Bergamo. If you wish to check the timetable for trains from Milano to Bergamo, check www.trenitalia.it. Click on the British Flag at the top of the screen for English and search “Milano” to “Bergamo” and the time of day you wish to travel. Across Lago Maggiore from the western shore of the lake, you can discern the stucco and terracotta tile roofed buildings of Santa Caterina del Sasso. 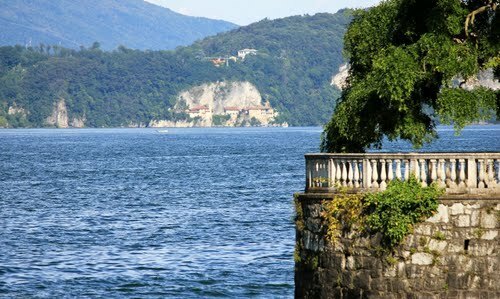 In the photo to the left, taken from a walkway just north of Stresa, you can see the monastery in the distance. It was during an 11th Century storm on Lago Maggiore that a merchant by the name of Alberto Besozzo was cast from his boat into the violent waters of the lake. Not a man known for his kindness or generosity, he prayed that he would be saved. Once safely on shore, he vowed to create a place of remembrance for the miracle of his survival. 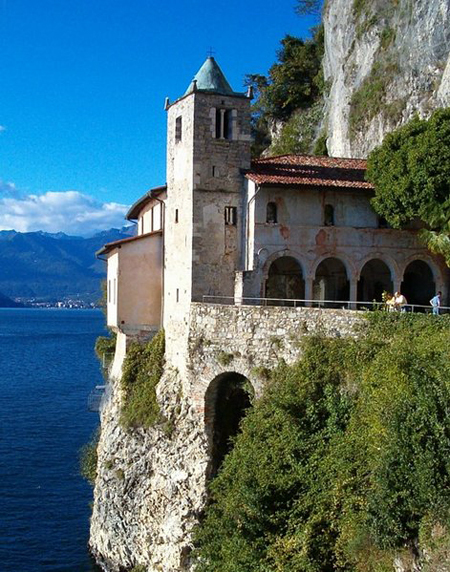 Alberto ensured that a chapel, dedicated to Saint Catherine of Egypt, was built on the rocks. The chapel was built directly above where he swam ashore during the storm. That chapel is now contained within the larger church of San Nicola. Between the 14th and 17th Centuries, brothers of Sant’Ambrogio from Milan cared for the hermitage. In latter centuries came the Carmelites, Dominicans and Benedictines. 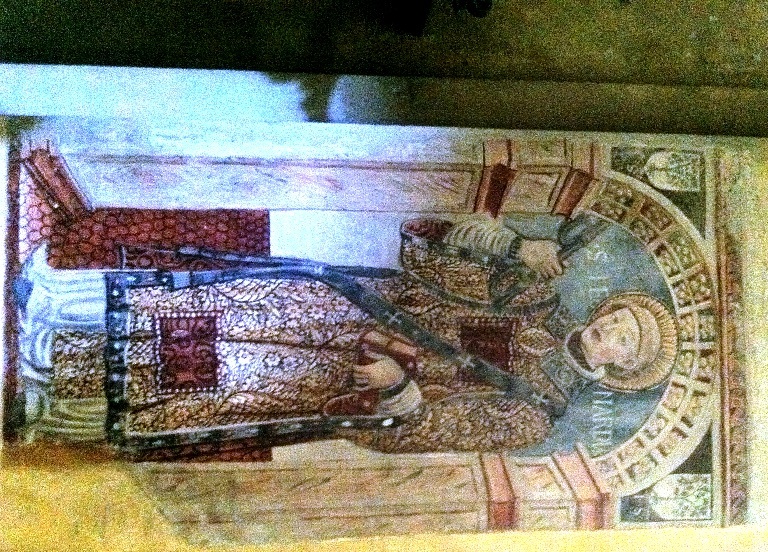 Within the chapel are the remains of the venerated Alberto Besozzo. The intimate interior of the space gives you a sense of the centuries; frescoed walls, floor tiles polished by the shoes of thousands and a revered silence in keeping with the history of the place. An event described as a miracle occurred in the latter part of the 18th Century. Several huge boulders fell through the roof of the church, but stopped suspended, above one of the side chapels. After this event, the hermitage became known as “Santa Caterina del Sasso Ballaro (Saint Catherine of the Dancing Rock). This is a site known more, by visitors, for its incredible position along one of the steepest rock faces on Lago Maggiore. The buildings literally cling to the rocks. Approaching the structures for the first time is breathtaking. Due to its rather remote position on the lake, there are far fewer ferries that provide transport to this magical place. Best time to visit is in the afternoons. There is a ferry at 2:15PM from Stresa directly over to the monastery. Visits take only about an hour. 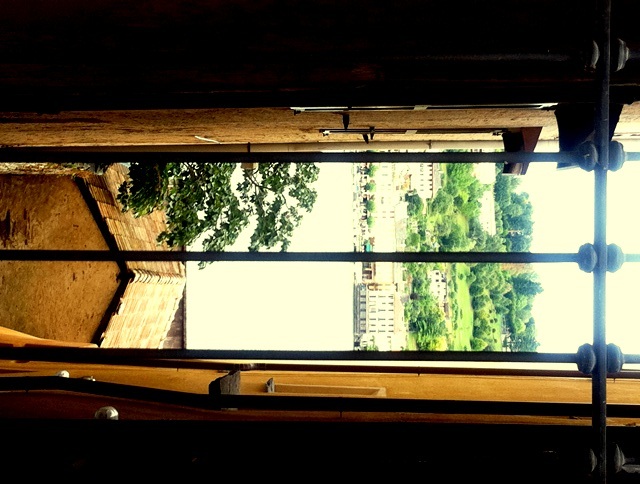 If you wish to have some refreshment, you can walk to the new elevator, recently opened, that connects the lake level to a hotel and cafe. Check times before ascending the elevator. Hours are unpredictable. Hours: From March through October open every day, 8.30 to 12.00 and 14.00 to 17.00. In my previous post, I discussed the most famous of the Borromean Islands, Isola Bella. Now to the other two islands, one of the fishermen (Pescatori) and one of the earth (Madre). Isola Superiore dei Pescatori, called ‘superiore’ due to its position as the northern most of the three islands, is no longer owned by the Borromeo family. (For purposes of this post, I will refer to this island as Isola Pescatori). 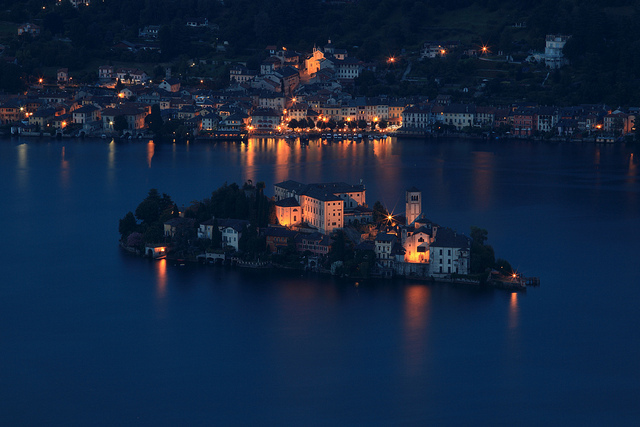 Only Isola Bella and Isola Madre remain in the hands of that family. A little over 1200 feet in length and 335 feet wide, the small island offers narrow lanes, geranium laced balconies, and plenty of places to enjoy a lunch or dinner. The Church of San Vittore was probably built on the foundations of a 9th Century church. Evidence of island occupation to that century exist on both this island and Isola Madre. Vendors in stalls and small shops cover this island, as do many restaurants and small hotels. 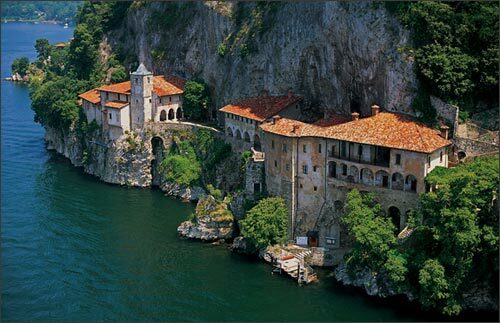 If you visit Isola Bella in the morning, Isola Pescatori is the perfect place for lunch and a break during your day visit to this area of Italy. The island of Madre is located about ten minutes, by ferry, from Isola Pescatori. There is, as on Pescatori, evidence of a 9th Century church and cemetery. During the 16th Century, two important activities started on the island; the first was the start of construction on the family villa and the second was the introduction of citrus trees brought from the province of Liguria along the Mediterranean coast. In the latter part of that century, the family completed the villa in Renaissance style. The garden, which now covers over ninety percent of the island, was substantially diversified. It now includes a wide variety of botanical specimens from around the globe. The scala dei morti (stairs of the dead), dedicated to the memory of the 9th Century cemetery, are now covered in different varieties of Wisteria. This is the least developed of the Borromean Islands, so do not expect vendors and lots of commercial activity. Today, visitors find peaceful and beautifully maintained gardens and villa. Of all the Borromean Islands, this is the most tranquil. 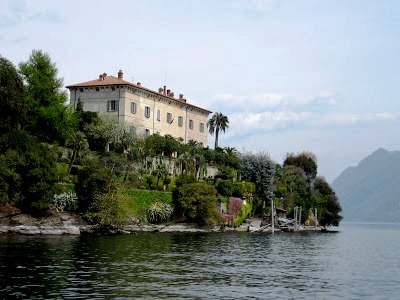 Both Isole Pescatori and Madre are reached by ferry from many of the lakeside towns around the lake. Tickets are available at all ticket offices. Double check last trip departures from these islands to ensure that you are not left behind. If you do, indeed, miss the last ferry from either of these islands, you will have to pay for a private launch to return you to your home base. See my next post “Lago Maggiore-Where to Stay and Where to Eat”.